Presented here is a brief biography of His Divine Grace Srila Bhakti Sundar Govinda Dev-Goswami Maharaj published originally in the Revealed Truth. His Divine Grace Srila Bhakti Sundar Govinda Dev-Goswami Maharaj made his appearance in this world on 18 December 1929 in the holy land of Sri Gaura Mandal in a village known as Bamunpara within the Burdwan district of West Bengal, India. Like the sun rising and inspiring lotuses to bloom, Srila Govinda Maharaj appeared in a brahman family and filled the land of Sriman Mahaprabhu with joy. His family's ancestors were followers of Sri Nityananda Prabhu, and from his boyhood he engaged in the service of his family's Deities, Sri Sri Radha-Gopinath, who were installed by Nityananda Prabhu's son Virachandra Prabhu. At the age of seventeen he met his Divine Master, Srila Bhakti Raksak Sridhar Dev-Goswami Maharaj. He perfectly fulfils his Gurudev's most cherished desires. Almost immediately after he arrived, Srila Sridhar Maharaj recognised his divine qualities and publicly declared that he would prepare him to be the future Acharya of Sri Chaitanya Saraswat Math. Srila Sridhar Maharaj's mission was to propound the glory of Sriman Mahaprabhu according to the teachings of Srila Rupa Goswami Prabhu and his followers, led in modern times by Srila Bhakti Siddhanta Saraswati Thakur. Srila Govinda Maharaj acted to fulfil this desire of his Gurudev in every possible way. He set up a printing press and published numerous books and magazines filled with the writings of the Rupanuga sampradaya's Acharyas. He led tours to the pilgrimage sites all over India that are associated with Saraswat Gaudiya Vaisnavism. He established the annual Sri Nabadwip Dham Parikrama festival at Sri Chaitanya Saraswat Math, which has continued without interruption since 1948. He made the arrangements for the installation of the Math's Deities Sri Sri Gandharva-Govindasundar and collected the funds needed to construct the domed Temple in which They reside. He travelled to towns and villages both near and far to spread Sriman Mahaprabhu's Nam-sankirtan-dharma and inspire souls to take shelter at the lotus feet of Sri Guru. The countless endeavours he made in service to his Gurudev cannot be summarised. Srila Govinda Maharaj also served Srila Sridhar Maharaj intimately as his doctor and confidant. Their relationship was so developed that many have described them as a shining example of the perfect Guru and perfect disciple. Srila Govinda Maharaj has described himself as being "bound by affection" to his Gurudev's feet, and Srila Sridhar Maharaj felt such attachment to Srila Govinda Maharaj that at times he could not tolerate his separation for even a few hours. He is fully adorned with the blessings of his Gurudev's associates. Over the course of the forty-two years that they lived together, Srila Govinda Maharaj had the fortune of serving many of Srila Sridhar Maharaj's godbrothers and observing their loving interactions with Srila Sridhar Maharaj. Leading preachers like Sripad Bhakti Saranga Goswami Maharaj, Sripad Bhakti Prajnan Kesav Maharaj, Sripad Bhakti Vichar Jajavar Maharaj, Sripad Bhakti Dayita Madhav Maharaj, and Sripad Bhakti Kamal Madhusudan Maharaj would come to Sri Chaitanya Saraswat Math to honour Srila Sridhar Maharaj, and while there would always affectionately encourage Srila Govinda Maharaj. Srila Bhakti Siddhanta Saraswati Thakur's sister, Srila Bhaktivedanta Swami Prabhupad's sister Bhavani Didi, and Srila Sridhar Maharaj's sister Rama Didi, and other noble ladies, also blessed Srila Govinda Maharaj during his youth. During the late '40s and early '50s Srila A. C. Bhaktivedanta Swami Prabhupad ran a preaching centre on behalf of Sri Chaitanya Saraswat Math in Kolkata. As a young brahmachari, Srila Govinda Maharaj would stay with Srila Swami Maharaj for a few months each year. Daily, Srila Swami Maharaj would teach him verses from Srimad Bhagavad-gita, and he would cook for Srila Swami Maharaj. During this time Srila Swami Maharaj also trained him as a preacher by engaging him as the first distributor of Back to Godhead magazine. When Srila Govinda Maharaj started Sri Chaitanya Saraswat Math's Sri Gaudiya Darsan magazine, Srila Swami Maharaj wrote a letter of appreciation for his service: "[Your writing] is not only very amusing but instructive. ... In time you can become a great transcendental humourist in the art of journalism. You have complete mercy from your Divine Master and you can depend on his blessings for your future improvement. I sincerely wish you all success. Undoubtedly you are now in the highest order of varnashram-dharma, but we cannot forget that you belong to the category of our affectionate sons. We cannot forget all such filial love for you, and when we see that you are improving in all respects it gladdens our heart." He is expert in all aspects of Vedic knowledge, both conceivable and inconceivable. Srila Govinda Maharaj's command of the revealed scriptures amazed everyone who met him. From his childhood he had a remarkable memory, and when he came to the Math he quickly memorised hundreds of songs and thousands of verses on his Gurudev's order. From that time until his final days he could readily recite Srimad Bhagavad-gita, Sri Chaitanya-charitamrita, large portions of Srimad Bhagavatam, and countless verses from other texts. Within two or three years of joining he could lecture with more authority than many of his Guru's godbrothers. Srila Govinda Maharaj's capacity to recount and explain the scriptures pleased Srila Sridhar Maharaj so much that when Srila Govinda Maharaj was a brahmachari of only two years, Srila Sridhar Maharaj gave him the title 'Vidya Ranjan' [one whose knowledge delights others]. Srila Sridhar Maharaj also later stated in his last will and testament: "Above all, he [Srila Govinda Maharaj] is well-known and unanimously acclaimed as being firmly established in the philosophy of the perfect axiomatic truth of bhakti as propounded by both myself as well as by my Divine Master." Srila Govinda Maharaj wrote numerous poems and articles in Sanskrit and Bengali, which he published in the magazine he ran on behalf of Sri Chaitanya Saraswat Math, Sri Gaudiya Darshan. His writings blend siddhanta with wit, sweetness, and humour to melt both the heart and mind. Srila Sridhar Maharaj's godbrothers sometimes mistook his compositions for those of Srila Sridhar Maharaj, which they revered as nondifferent from Srila Rupa Goswami Prabhu's writings. Srila Govinda Maharaj's expertise also went beyond scriptural theory; he was adept at leadership, organisation, fund-raising, construction, cow care, gardening, and cooking. As the Math's manager, he excelled at all services by virtue of his extraordinary intelligence and could expertly put the teachings of the scriptures in practice according to time, place, and circumstance. He is the pre-eminent follower of Srila Rupa Goswami Prabhu's line. Srila Bhakti Raksak Sridhar Dev-Goswami Maharaj was empowered by Srila Bhakti Siddhanta Saraswati Thakur to be the self-effulgent Acharya of the Rupanuga sampradaya. At the time of his departure, Srila Saraswati Thakur requested Srila Sridhar Maharaj to sing the sampradaya's anthem, Sri Rupa Manjari Pada. As Srila Sridhar Maharaj's beloved disciple, Srila Govinda Maharaj, and only Srila Govinda Maharaj, sang this song for him on suitable occasions. 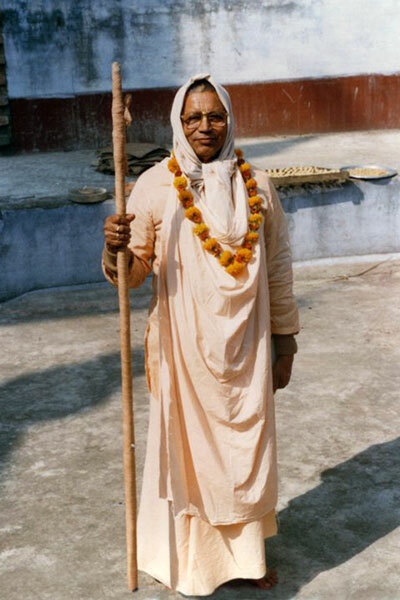 Srila Govinda Maharaj served Srila Sridhar Maharaj as a servant, a friend, and an affectionate guardian. All the stages of the relationship between Guru and disciple described in the Rupanuga sampradaya were present between Srila Govinda Maharaj and Srila Sridhar Maharaj. Srila Govinda Maharaj's service to Srila Sridhar Maharaj illustrates the meaning of Sri Rupa Manjari Pada, that the service of Sri Rupa (Sri Guru) is one's life, wealth, joy, fulfilment—everything. He is known as Srila Govinda Maharaj. In 1985 Srila Sridhar Maharaj conferred sannyas upon Srila Govinda Maharaj, giving him the name 'Bhakti Sundar Govinda'. Srila Govinda Maharaj once asked Srila Sridhar Maharaj about his name, and Srila Sridhar Maharaj replied, "My Deity is Govinda and my kunda is Govinda, so your name must be Govinda." Srila Sridhar Maharaj established his Math on the bank of Sri Govinda Kunda and Sri Govindasundar as its central Deity. Holding both this place and this form of the Lord most dearly within His heart, he gave the name Govinda to his dearmost associate, Srila Govinda Maharaj, who he treasured like his most precious jewel (Govindabhidham Indirasrita-padam hastastha-ratnadivat). His beautiful, exalted, effulgent form is filled with devotion. Srila Sridhar Maharaj has the deepest esteem for Srila Govinda Maharaj. He remarked, "Actually in many ways he is more qualified than I am." Also: "He came [to me] with some previous wealth"; "He is a natural paramahamsa"; "His service never leaves the nirguna plane"; and "If you get to know him more intimately, you will come to understand what sort of transcendental character he has." Srila Govinda Maharaj created the atmosphere of Vraja Dham wherever he went. His seemingly simple, yet deeply loving and profound personality can only be understood as a manifestation of the aprakrita realm. His seniors, peers, and followers all marvelled at the beauty of his form and the sweetness and strength he exhibited as he related naturally and intimately with all. His captivating affection awakened the dormant spirit of devotion from within the hearts of thousands and forcibly inspired them to dedicate their lives to the service of Sri Guru and Sri Gauranga. He is the Guru of the world. Srila A.C. Bhaktivedanta Swami Prabhupad requested Srila Govinda Maharaj to tour the world with him in the mid '70s to preach to his disciples. Because Srila Govinda Maharaj was Srila Sridhar Maharaj's personal doctor and Srila Sridhar Maharaj's health was unstable at that time, Srila Govinda Maharaj declined. At that time both Srila Sridhar Maharaj and Srila Swami Maharaj prophesied that in the future he would tour the world and inspire their followers on the path of pure devotion. In the early '80s, when Srila Swami Maharaj's disciples and admirers, who were mostly Westerners, started to frequent Sri Chaitanya Saraswat Math, seeking guidance and shelter, Srila Sridhar Maharaj did not readily accept them because of his advanced age and ill health. It was only when Srila Govinda Maharaj promised to look after them following Srila Sridhar Maharaj's passing that Srila Sridhar Maharaj sheltered and initiated them. Following the disappearance of Srila Sridhar Maharaj in 1988, Srila Govinda Maharaj, as the President-Sevaite-Acharya of Sri Chaitanya Saraswat Math, toured the world twenty-four times over the course of eighteen years. He oversaw the opening of over 100 centres on six continents and the distribution of over 350 publications in twenty languages. He crossed linguistic and cultural boundaries and inspired thousands of people of all ages by communicating with them heart-to-heart. He would often recall with a beaming smile, "The sun never sets on Sri Chaitanya Saraswat Math." He distributes the seed of divine love for the Supreme Lord. In 1986 Srila Sridhar Maharaj fulfilled the desire he had cherished for almost forty years and established Srila Govinda Maharaj as the President-Sevaite-Acharya of Sri Chaitanya Saraswat Math and all of its centres worldwide. Thereafter Srila Govinda Maharaj initiated the sincere seekers who approached Sri Chaitanya Saraswat Math into the service of Sri Guru and Sri Gauranga. Initiation is compared to the planting of a seed, the seed of divine love, within the heart. As seeds must be nourished and protected in order to bear fruit, so Srila Govinda Maharaj affectionately guided the disciples of Srila Sridhar Maharaj, Srila Swami Maharaj, and himself in their practising lives. His wisdom, experience, character, and charm inspired deep faith within all, and his instructions dispelled all inauspiciousness. He encouraged everyone, regardless of the position they were in, and emphasised chastity, sincerity, love, and affection. He showed by example that serving Sri Guru and Vaishnava and practising Sriman Mahaprabhu's sankirtan-dharma is the real path towards the service of Radha-Krishna in Vraja Dham. His foremost advice was to adhere to Sriman Mahaprabhu's formula for chanting the Holy Name: to be humble, be tolerant, and give honour to others without expecting it for oneself. His Divine Grace Srila Bhakti Sundar Govinda Dev-Goswami Maharaj departed from this world on 27 March 2010. Since then his Samadhi Mandir, the Temple of Love and Affection, has been erected in his honour at Sri Chaitanya Saraswat Math Nabadwip, and his faithful followers continue to serve Sri Guru and Sri Gauranga according to his instructions. Before his departure, Srila Govinda Maharaj declared Srila Bhakti Nirmal Acharya Maharaj to be his Successor as the Sevaite-President-Acharya of Sri Chaitanya Saraswat Math, and appointed Acharyas from Western countries to lead the development of Sri Chaitanya Saraswat Math worldwide. Srila Govinda Maharaj's divine grace continues to shine brightly in the hearts of his sincere followers and through his divine instructions.